People Sized Bird House - a project that maximizes experience and imagination through design ingenuity & digital fabrication, the Gourd was brought to life by over 40 Overland Pheasants (employees) under the care and direction of Patrick Winn. 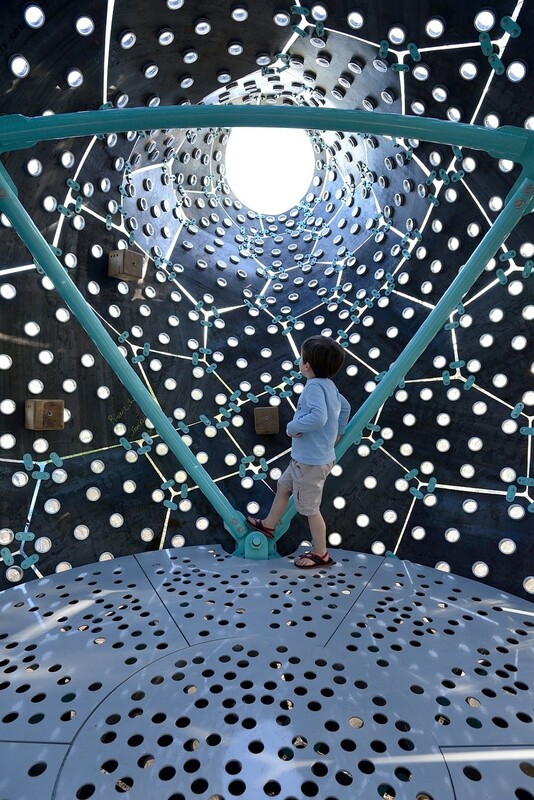 Built for the San Antonio Botanical Gardens, the Overland Gourd is a human-sized bird house meant to inspire creativity and imagination while pushing the limits of digital design and fabrication. Designed from a Purple Martin gourd (AKA the bottle gourd), it is built out of 12GA Cor-ten plate steel that is wrapped around a robin’s egg blue internal octahedron structure and perforated with over 1,000 Ball Mason jars. The jars are sources of light and life from the surrounding world. Testing the boundaries of digital design and fabrication, 70 steel plates, each unique in shape and size, emulate the patterns of a dragonfly wing and were fabricated using CNC technology. Assembled and fabricated in-house by the Overland WorkShop, the project serves as an exemplar model of high-end digital fabrication and finely honed craft to bring an experientially unexpected space to life. Check out Overland Partners for more information!